Last year we did a cycling trip from Innsbruck to Verona and it was so wonderful that we wanted to do the same kind of thing again, only somewhere different. 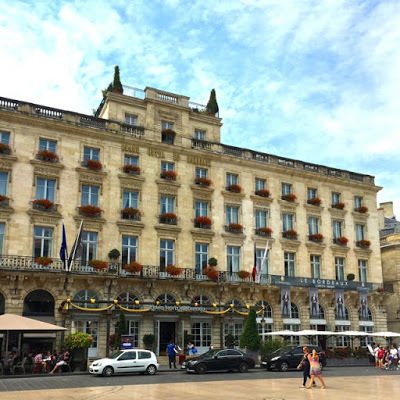 We love the south-west of France and had glimpses of Bordeaux on a previous trip, vowing to return – the city and whole region is just so lovely. This was where our trip this year started. 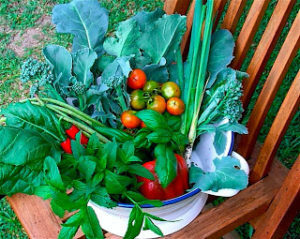 How bad could cycling through the premier wine growing of France be with its chateaux, historic villages, through the forests of Aquitaine to the seafood heavens of Arcachon and Cap Ferret on the Atlantic coast – staying in comfort and eating and drinking some of the best you can get along the way? First let me point out that we own no lycra, but after last years’ experience we did get some cycle touring shorts that have a kind of padded nappy insert – as he said “all ready for the nursing home Nanma”? The companies that we organise these tours through take all of the stress out of the trip – you just have to turn up, get on the bike and pedal! They organise: the bike – touring upright kind with panniers and basket, repair kit for the bike, helmet, book hotels in advance with choice of standard (we go 3-4 star – come on, I’ve been on a bloody bike all day), take your bags from hotel to hotel and provide you with comprehensive and detailed daily route maps that include places of interest, historical background and recommended restaurants. 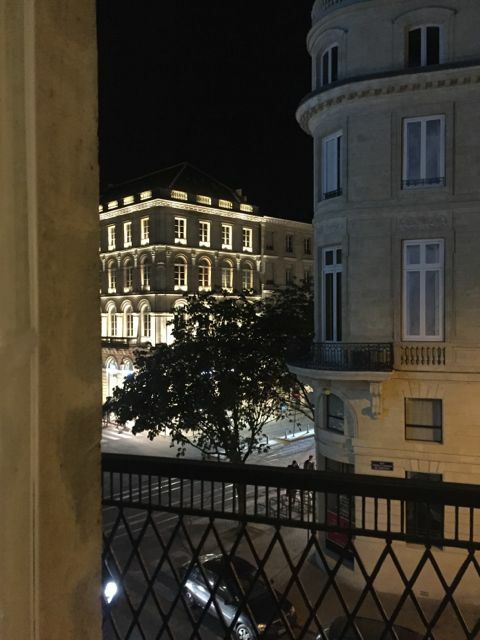 If you have never been to Bordeaux – go! 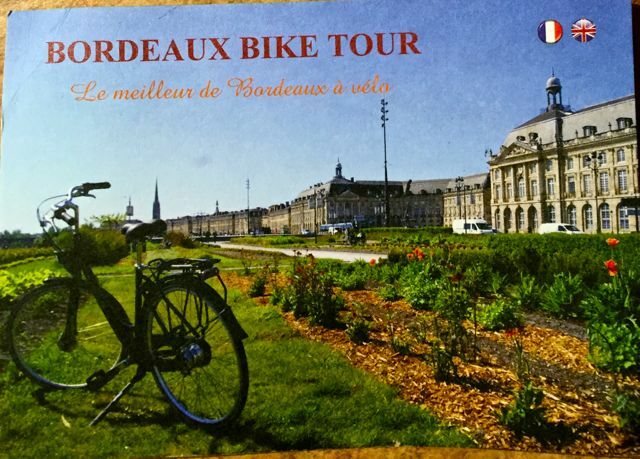 Fortunately we decided to have a two day break in Bordeaux before the cycle trip started – it’s wonderful!! Fifteen years ago was not the thing of wonder it is today. After an extreme makeover under mayor Alain Juppe (former French Prime Minister), Bordeaux was admitted to UNESCO’s World Heritage Register in 2007 and now shines in majestic splendour beside the Garonne River. On that previous trip we had driven past Place de Bourse and thought wow! I have since read that it judged to be the most magnificent riverside squares anywhere in the world. My photo doesn’t do justice to it’s romantic grandeur. Beautiful pale limestone buildings surround three sides of the square that front the Garonne River – the lifeblood of this historic wine growing region – topped with grey slate moulded roofs. You would not be wrong in thinking that you could be in Paris because, if not designed by Baron Hussmann, then the style was certainly copied when Bordeux got a complete makeover in the 18th century banishing its grot to history. Hotel Bordeaux with its award winning restaurant and the kind of clientele who double park their Ferraris and Lamborghinis right outside. Place de la Comedie. Unfortunately, this was not where we stayed – next time. 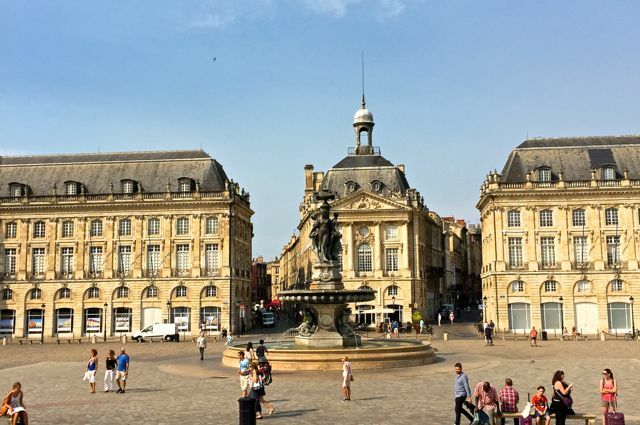 What also makes Bordeaux refreshingly lovely is that you can actually enjoy the place on foot for much of it, like Place de Bourse, is pedestrian only. They also have a fantastic network of cycle paths and terrific light rail – with no overhead wires – that connects all the transport hubs and stopped right outside our hotel in the centre of town at Place de Comedie – making it easy and inexpensive for us to get from the airport and around the rest of the city. Grand Theatre de Bordeaux from 1780, Place de la Comedie. An astounding building of the Classical style, crowned by nine statues of the muses. Daily tours of the building only in July and August when there are no nightly performances. Make sure you do a tour or book yourself a performance ticket – the interior is breathtaking. 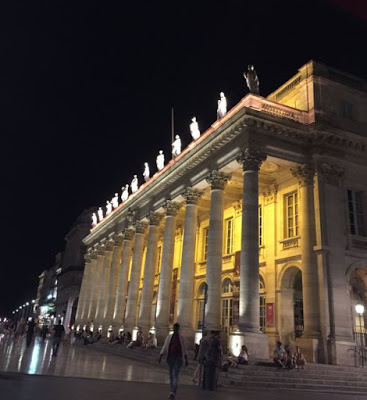 What to do with two days in Bordeaux? 1. First of all, stay in the historic city centre with walking distance to most places of interest. We stayed at Hotel du Normandie at the junction of Place de la Comedie and Quinconces (tram and bus stop). Housed in one of Bordeaux majestic 18th century buildings – most of the rooms are huge with soaring ceilings and windows – just make sure you ask for one of these on the side away from the tram stop! Or stay in one of the numerous other hotels in the city centre. Hotel du Normandie was chosen for us by the bike company, and very happy we were too. 2. Take the hop-on, hop-off tourist bus. I’m a big fan of these for ‘getting the picture’ when you arrive in a city for the first time. The one in Bordeaux stops right outside the very good Tourist Information Office – handily located opposite our hotel with the audio on the bus giving a good background history. You can spend the whole day on there, if you want to, exploring places of interest on the way. They are inexpensive, with discounts for seniors and students, and usually last one or two days. 3. Hire one of the bikes that you can pick-up from one of the many bike stations around the city, and take a trip along the Garonne River on one of the numerous signposted bike tracks that criss-cross the river. You can also take day cycling trips around some of the most famous chateaux and vineyards of the region. 4. Go shopping, get a French haircut and stop for an aperitif on the way home. Rue St Catherine (pedestrian) has some fabulous shops, including Galleries Lafayette (Paris) where I managed to pick up a good, black, travelling frock (scarce as hens teeth in Mullumbimby) while waiting for a hair appointment – makes a girl happy. Me mate was equally content exploring the Aquitane Museum – Bordeaux archeological museum – which, he said, was really terrific. Stop on the way home for an aperitif on the gloriously romantic terrace of the Grand Theatre Bar and Restaurant and, well, just let your mind wander! 5. 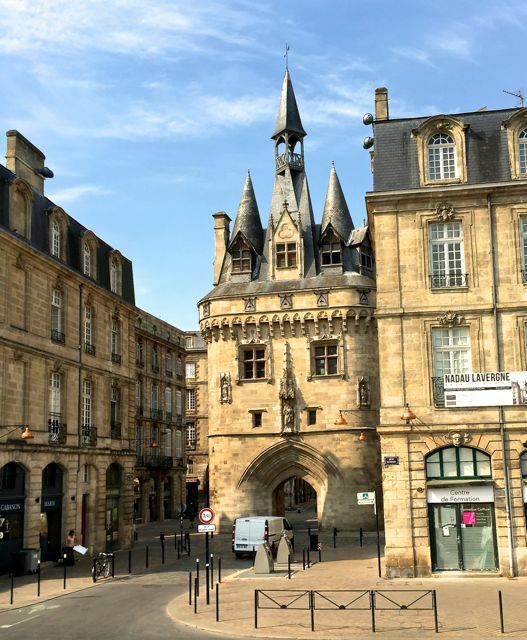 Bordeaux has 8,000 plus chateaux scattered among this famous wine growing region so taking one of the many themed tours that visit the premier vineyards is a must. It’s easy to book through the Tourist Office, or online in advance if it is busy time of the year. We missed out because it was August and we hadn’t pre-booked, but we would have gone for the afternoon/evening dinner tour that visited Chateaux Lafitte Rothschild and Margaux having dinner in the Historic village of St Emilion. We weren’t too disappointed though as we were going to be cycling through the Sauterne and Graves vineyards in a couple of days. Timbale of fresh tomato, whipped light goats cheese and small pot of octopus salad with capers. My delicious entree at the Brasserie d’Orleans. A LITTLE STORY: Me mate was busy trying to order a bottle of red wine amidst a lot of confusion – not understanding what grape varieties were on offer – with French wine you are expected to know that simply from the vineyard – we are not that smart. 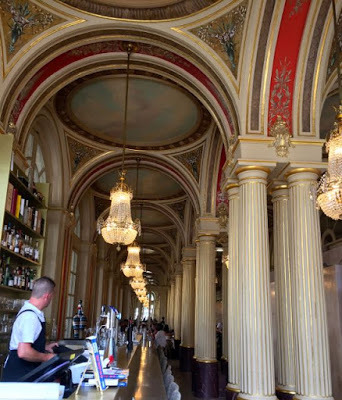 At this point the waiter brought over a bottle of wine from the sauve, silver haired gentleman at the next table, who had been listening to our conversation, with a “Monsieur Claude would like you to try his wine – he thinks you may alike it”. M. Claude was correct – we struck up a conversation and found out that Bordeaux was his home and, when not travelling, ate at Brasserie d’Orleans every night, as we subsequently did and then asking for a bottle of the ‘M. Claude’ when we ordered and every waiter knowing exactly what we meant. Got to love that! 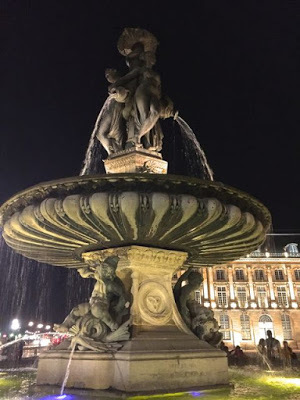 End your evening out with a wander down this vast tree-lined esplanade to the lights twinkling along the Garonne River – the statues and fountains in this huge park are fantastic.